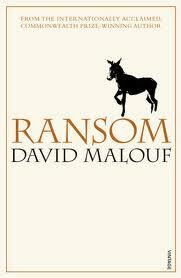 Ransom is David Malouf’s retelling of one small episode from Homer’s Iliad, that of Hector’s death at the hands of Achilles. If you don’t know, or can’t recall, this particular event, it begins when Achilles, having been offended by the leader of the Greek army, Agamemnon, takes what can only be described as ’the huff’ and refuses to fight, or to allow his own soldiers to fight. Cue a Trojan attack which sees the Greeks driven back to their ships and in danger of losing the war. Patroclus, Achilles’ childhood friend, begs Achilles to allow him to put on Achilles’ armour and go into battle in the hope that the very sight of him will inspire the Greeks and put fear into the hearts of the Trojans. His plan works, but Patroclus is killed by Hector. Achilles swears he will have revenge and challenges Hector, killing him and then refusing to give up the body, instead dragging it around the walls of Troy by chariot for all to see. If nothing else, it reveals that Homer’s heroes are far from two-dimensional. This is clearly not how you or I would express the same feelings (should we ever plunge a sword into our arch-enemy), but it does contain a beautifully rendered psychological truth that we can connect with. Malouf devotes one of the novel’s five sections to Priam’s plan and the debate which surrounds it, simultaneously highlighting its importance and delineating his relationship with his wife and children. Each section seems to me perfectly shaped, each containing not only an important part of the story and insight into the two main characters, but also an appropriate memory (for example, in the first section Achilles remembers his first meeting with Patroclus; in the second Priam remembers being saved from death as a small child in the ruins of a burning city) and an intimation of the future. Throughout Malouf is clearly concerned with fathers and sons. Within the first few pages, Achilles thinks of his own son (“In these nine years his own son, Neoptolemus, away there in his grandfather’s house, has been growing up without him.”) Priam reminds him of his son when appealing for Hector’s body (“You are, I know, the father of a son you have not seen for more than half his lifetime.”). When Priam first appears Achilles mistakes him for his own father. On their journey to the Greek camp, the carter also talks of his sons, and one in particular who “grew up strong as a bull” (perhaps reminding us of the Greek and Trojan heroes) and died trying to exercise that strength by lifting a cart which had become stuck in mud. His changing of his sense of self seems the bravest act of all. You are currently browsing the archives for the David Malouf category.